Right now, tuna fishing is off the charts “crazy good”! Please read more below, about how our overnight, tuna trips can really mean the adventure of a lifetime for you! Contact us today to book your offshore, tuna fishing adventure! When taking an offshore, day or night, tuna charter, expect a positive, memorable fishing experience. At Biloxi Bluewater Charters, we specialize in putting you on tuna, figuratively speaking, of course! Tuna, particularly yellowfin tuna, are one of the most sought after fish in the Gulf of Mexico. Yellowfin tuna, also known as “ahi”, in Hawaiian, are an aggressive, fast swimming fish, which fight hard and test your endurance. Yellowfin tuna slash about and are typically found in schools. It is exciting to see these schools of tuna chase bait fish and break the surface of the water! The Mississippi Gulf Coast is, literally, one of the best locations in the world, to catch tuna. It is centrally located, between Florida and Louisiana, and offers a broad, fishing expanse. Captain Jerry knows these waters, and he can find the fish and “hook you up”! During the summer months, tuna are generally in deeper water but later find more shallow depths, during the fall and winter months. The average size of tuna in the Gulf of Mexico ranges from thirty to sixty pounds; but, prepare to hook a one hundred fifty, or greater, pound tuna! It could happen to you! As an added bonus, you often catch other predator fish while trying to haul in tuna; such as mahi-mahi, wahoo, marlin, sailfish, etc. With Captain Jerry McClure you are in wise hands! They have an abundance of fishing experience; to travel over ninety miles offshore, if necessary, to realize a prime, fishing spot. Biloxi Bluewater Charters is noted for finding and catching quality fish. To this end, the captains use multiple techniques, including kite fishing, top of water lures, live bait fishing, chumming, etc. 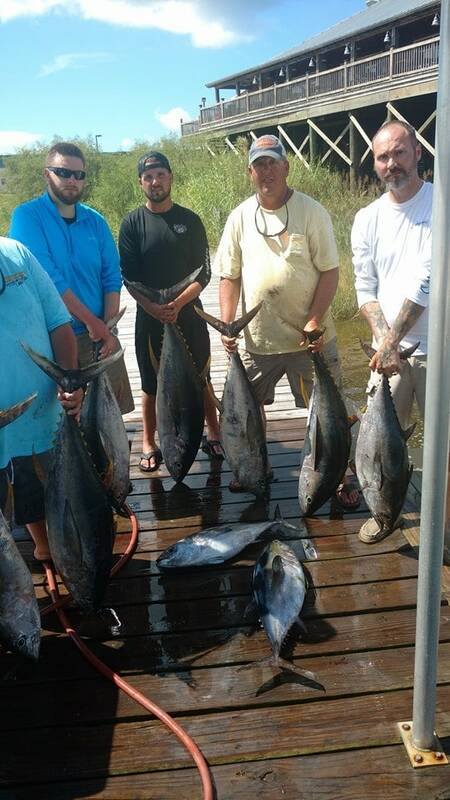 Offshore quests for tuna book quickly; please contact us today, at Biloxi Bluewater Charters!